for the first time with dirty looks and guilty feelings flying around, eh?! 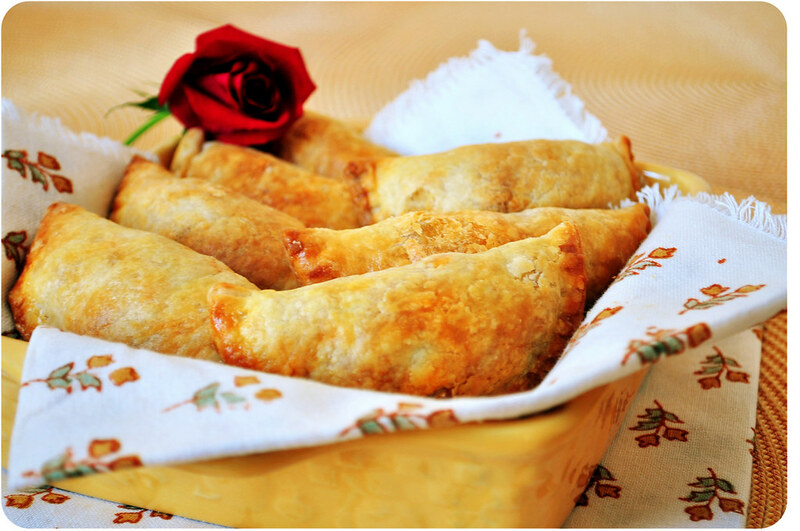 Kath chose Empanadas as the theme for the month of March. 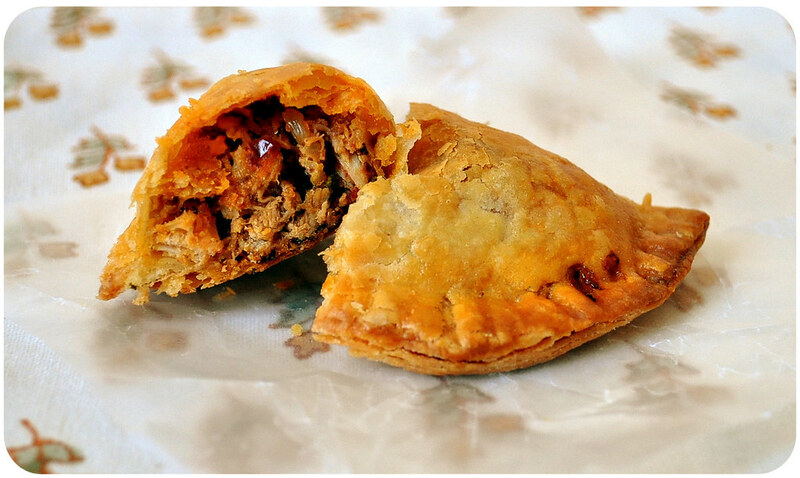 I have had empanadas at Mexican restaurants before, where they are typically fried. I am not a huge fan of deep fried food, so, although they were tasty, I did not develop a bond with them. Then at a friend's party, one of the guests had brought baked empanadas which were awesome. I have been meaning to make them at home, since, but never really got around to it. So, this challenge was perfect. There are quite a few versions of empanada dough on the web. I finally did a hotch-potch of recipes drawing my inspiration from Layla of Laylita's Recipes. 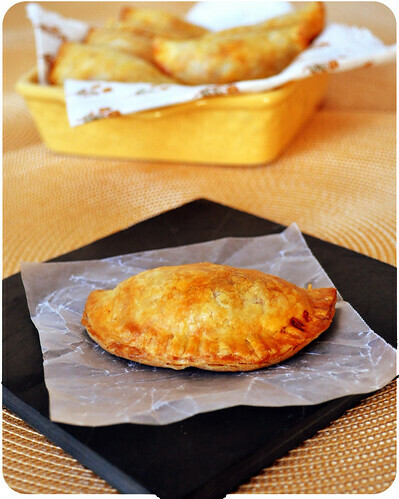 The empanada dough is very similar to a tart crust and so comes out nice and flaky. My choice of filling was chicken tossed with chipotle chilies and adobo sauce, queso and coriander. We loved them. They are like little pockets of happiness! The crust is crisp and flaky and the filling stays just moist. The cheese had melted nicely and blended into the chicken, rounding off the spice from the chipotle peppers. I didn't make any dips with it but I can see it pairing nicely with something avocado. Heat the oil in a heavy bottomed pan. Saute the onions and garlic until translucent. Add the chicken, chopped peppers, adobo sauce and cumin and toss to coat. Cook for a few minutes. If it gets too dry, add water to get the right consistency. Remove from heat and cool to room temperature. 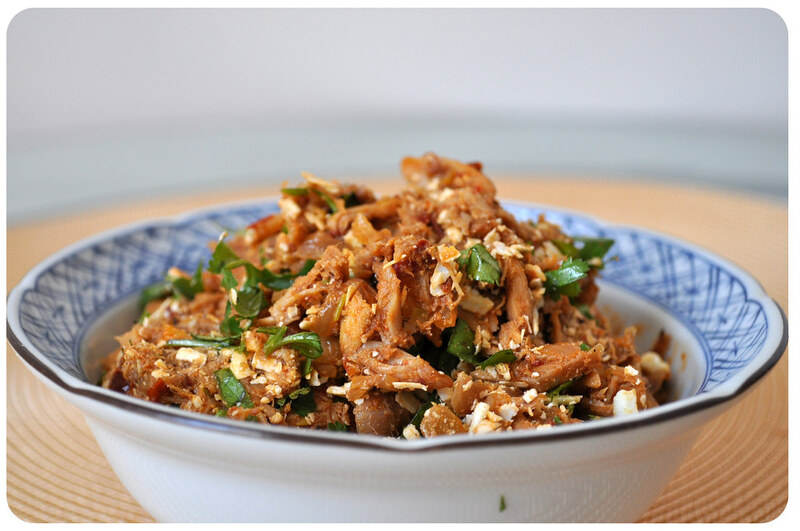 Mix the cheese and coriander into the chicken mixture. Remove the dough from the fridge and roll out to 1/8 inch thickness. Cut out rounds of the size you want (I used 4 inch cutters). Place about a tablespoon (or appropriate for your size) of the filling a bit off center and spread to the edges leaving a 1/4 inch border. Brush the border with egg whites (which act as a natural adhesive, I learnt this from making Cannolis). Fold the dough over the filling and press the edges to seal. You can use a fork to make groove marks on the edges. 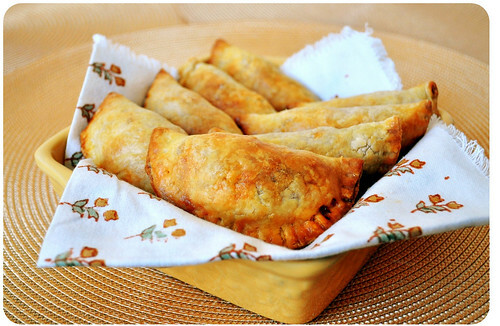 Freeze the filled empanadas for 10-15 minutes. This is a trick I picked up making tart dough. It lets the butter firm up again ensuring there is no shrinkage and in this case allows the gluing process to complete, so there is no disaster in the oven. Preheat oven to 400F and baked the empanadas for 20-25 minutes until golden brown and flaky. Cool for just a few minutes and serve immediately. Combine the flour, baking powder and salt. In a food processor pulse the flour with the cold butter until you get a crumbly mixture. Transfer to a bowl. Add the egg and milk and knead in to form a sort of dough. Dump the dough onto a lightly floured surface and bring together into a ball. Pat into a circle of 1 inch thickness, wrap and refrigerate for atleast 30 minutes. If you’re interested in joining our Kulinarya Cooking Club, please feel free to check out the KCC Facebook page and leave a comment – we would love to hear from you!